Tired of being caught off guard by a power outage? Nexus is dedicated to ensuring your home life is stylish, relaxing and comfortable. We provide quality inverters and stabilisers that help you cope with unexpected power cuts. They are expertly designed to ensure safe and efficient operation whenever you need them. Contact us today to find out more about our competitive inverter prices in Nigeria. Whether you want to buy an inverter or buy a stabilizer, you know you can rely on us for quality home solutions. Our products have been engineered by a team of technicians, who work with your comfort in mind. Each model we manufacture is meticulously tested and quality assured to comply with all regulations and standards. If you have any questions about a particular model, do not hesitate to contact us. Our experienced team is on hand to address any queries or questions you might have. An inverter is an electronic appliance that converts direct current (DC) to alternating current (AC). It allows a battery-based system to power appliances through your home wiring system. This means that you can run almost all your home appliances during the event of a power cut. 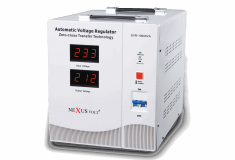 Inverters can produce power on a similar scale to what is normally produced in the home. This ensures you can always maintain the voltage you need to enjoy your creature comforts. Inverters require far less maintenance than your run-of-the-mill generators, mostly because of the oil and fuel replacement. All that is required is the occasional inspection of the batteries – usually done once a year. A stabiliser or voltage regulator is an appliance that is used to keep a steady output of volts in a circuit. This constant voltage current protects other appliances from damage caused by fluctuations in voltage. The primary concern for managing the voltage current going through your home wiring should always be your appliances. Ensuring that they are not exposed to extreme fluctuations helps to ensure they don’t break down before their time. Undoubtedly, you will be familiar with the frustrations you experience when your device shuts down or overheats. A contributor to components overheating is irregular and fluctuating voltage. Keeping the voltage current steady helps protect you against unexpected data loss. When your devices malfunction or stop working properly, they will need replacing. Using a stabiliser improves their durability, performance and longevity by keeping voltage fluctuations to a minimum. Our stabilisers will save you the hassle and cost of replacing your household appliances. Nexus’ success has been based on our ability to provide you with home solutions that ensure your comfort. Our power appliances are engineered to complement all the house appliances you have invested. If they matter to you, they matter to us. Contact us today and make sure you keep the power on at home with proven and affordable home power solutions.